The pure deliciousness that comes from eating a fresh doughnut is one of life's greatest pleasures. If you are lucky enough to live near an old school doughnut shop where the breakfast treat is prepared daily, then you know the difference between a fresh doughnut and one that has been sitting out for a couple of days. These days, most of us have to recreate this experience at home. If mom is a fan of doughnuts, she is definitely going to be obsessed with this recipe. These doughnuts are more cake-like (denser) because they lack yeast. The upside to leaving this particular leavening agent out is that there is no need for proofing which means you can eat your homemade doughnuts faster. 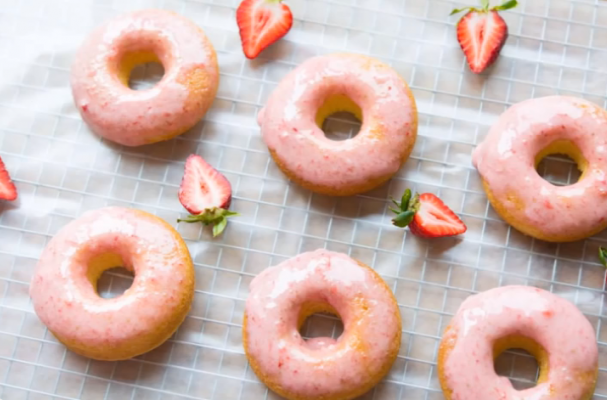 The fresh strawberry glaze is a must-have since it adds another dimension of flavor and looks pretty too.